Download "CPA & DESIGN MARK MEMBER AGREEMENT"
2 - 2 - software or other publication or product offered in print or electronically for sale by You or any third party authorized by you. Use by Express Written Permission. Any use not authorized by Section 3 above is prohibited unless express written permission is received from CPA Canada or the relevant Provincial CPA Body, whichever is appropriate. Samples and Inspection. If requested by CPA Canada or any Provincial CPA Body, You shall promptly submit to CPA Canada or such Provincial CPA Body samples of any materials used in association with the CPA Mark for inspection and approval by CPA Canada or such Provincial CPA Body. CPA Canada or such Provincial CPA Body may at any time, in its sole discretion, revoke permission to use the CPA Mark if your use does not meet with the standards established by CPA Canada or if you cease to be a member in good standing of a CPA Body, following which, You shall immediately cease use of the CPA Mark in association with the materials subject to such revocation. 4. VISUAL IDENTIFICATION AND DESIGN STANDARDS. General. The CPA Mark derives its strength from the simplicity of its design. For member use, it comprises three elements: the CPA symbol (the leaf), the CPA Wordmark (the graphic representation of CPA) and the profession descriptor (the words Chartered Professional Accountant(s)), (collectively, the Elements ) which have been designed to work together as well as function as part of a broader identity system. The CPA symbol, the CPA wordmark and the profession descriptor used together are called the CPA logo, and constitute a CPA Mark. 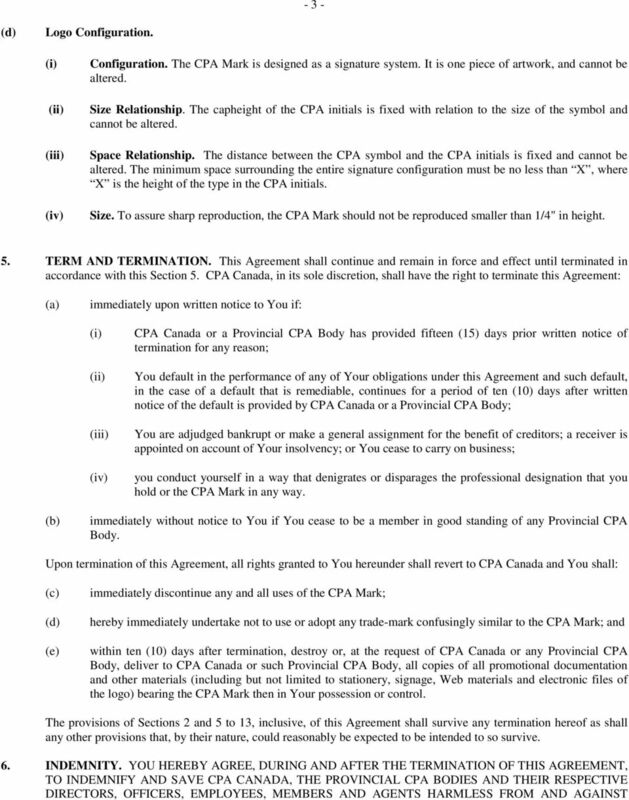 A copy of the CPA Mark is attached as Exhibit A to this Agreement. Approved artwork has been developed for the CPA Mark, and no other artwork is approved without prior permission from CPA Canada. CPA Mark Configuration. The CPA Mark consists of three graphic elements: the CPA symbol, a colour symbol with the maple leaf in dots on the left, is the design element; and the CPA initials, in upper case with a dropped P, is the word mark; and the words Professional Chartered Accountant(s) is the profession descriptor. 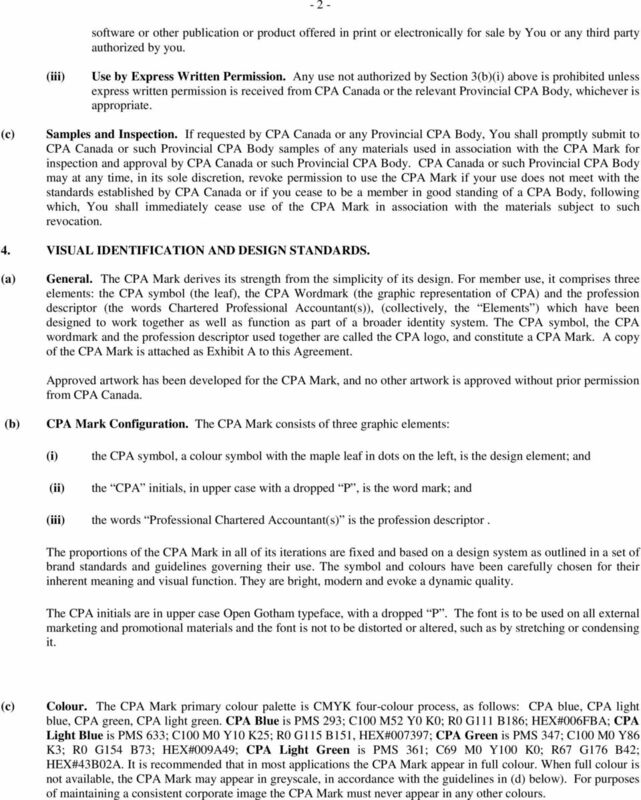 The proportions of the CPA Mark in all of its iterations are fixed and based on a design system as outlined in a set of brand standards and guidelines governing their use. The symbol and colours have been carefully chosen for their inherent meaning and visual function. They are bright, modern and evoke a dynamic quality. The CPA initials are in upper case Open Gotham typeface, with a dropped P. The font is to be used on all external marketing and promotional materials and the font is not to be distorted or altered, such as by stretching or condensing it. Colour. The CPA Mark primary colour palette is CMYK four-colour process, as follows: CPA blue, CPA light blue, CPA green, CPA light green. CPA Blue is PMS 293; C100 M52 Y0 K0; R0 G111 B186; HEX#006FBA; CPA Light Blue is PMS 633; C100 M0 Y10 K25; R0 G115 B151, HEX#007397; CPA Green is PMS 347; C100 M0 Y86 K3; R0 G154 B73; HEX#009A49; CPA Light Green is PMS 361; C69 M0 Y100 K0; R67 G176 B42; HEX#43B02A. It is recommended that in most applications the CPA Mark appear in full colour. When full colour is not available, the CPA Mark may appear in greyscale, in accordance with the guidelines in (d) below). For purposes of maintaining a consistent corporate image the CPA Mark must never appear in any other colours. 4 - 4 - ANY AND ALL LIABILITIES, LOSSES, SUITS, CLAIMS, DEMANDS, COSTS (INCLUDING COURT COSTS AND LEGAL FEES), FINES AND ACTIONS OF ANY KIND OR NATURE WHATSOEVER TO WHICH THEY SHALL OR MAY BECOME LIABLE FOR, OR SUFFER BY REASON OF YOUR USE OF THE CPA MARK OR ANY BREACH, VIOLATION OR NON-PERFORMANCE ON YOUR PART OF ANY TERM OR CONDITION OF THIS AGREEMENT. 7. NO WARRANTY OR LIABILITY. NOTWITHSTANDING ANY OTHER TERM OR CONDITION OF THIS AGREEMENT, THE CPA MARK IS PROVIDED AS IS AND THERE ARE NO WARRANTIES, REPRESENTATIONS OR CONDITIONS OF ANY KIND, ORAL OR WRITTEN, EXPRESS OR IMPLIED, IN FACT OR IN LAW, INCLUDING THE IMPLIED WARRANTIES OR CONDITIONS OF MERCHANTABLE QUALITY, FITNESS FOR A PARTICULAR PURPOSE, ENFORCEABILITY, VALIDITY AND NON- INFRINGEMENT AND THOSE ARISING BY STATUTE OR OTHERWISE IN LAW OR FROM A COURSE OF DEALING OR USAGE OF TRADE. IN NO EVENT SHALL CPA CANADA OR ANY PROVINCIAL CPA BODY BE LIABLE, WHETHER IN CONTRACT (INCLUDING FUNDAMENTAL BREACH AND BREACH OF A FUNDAMENTAL TERM), TORT (INCLUDING NEGLIGENCE) OR OTHERWISE, FOR DAMAGES (INCLUDING DIRECT, INDIRECT, INCIDENTAL, CONSEQUENTIAL, SPECIAL, PUNITIVE, EXEMPLARY AND AGGRAVATED DAMAGES AND DAMAGES FOR LOSS OF USE, PROFITS OR REVENUE OR FAILURE TO REALIZE EXPECTED SAVINGS) OR ANY OTHER REMEDY RELATING TO THIS AGREEMENT, INCLUDING THE TERMINATION OF THIS AGREEMENT BY CPA CANADA PURSUANT TO SECTION 5 ABOVE. 8. FURTHER ASSURANCES. You agree that You will do all such acts and execute all such further documents and the like, and will cause the doing of all such acts and the execution of all such further documents as are within Your power to cause the doing or execution of, as CPA Canada or any Provincial CPA Body may from time to time reasonably request, in writing, and as may be necessary or desirable to give effect to this Agreement. 9. INDEPENDENT CONTRACTORS. It is understood and agreed that in giving effect to this Agreement, neither party shall be or be deemed a partner or agent of the other party for any purpose and that the relationship of the parties shall be that of independent contractor. 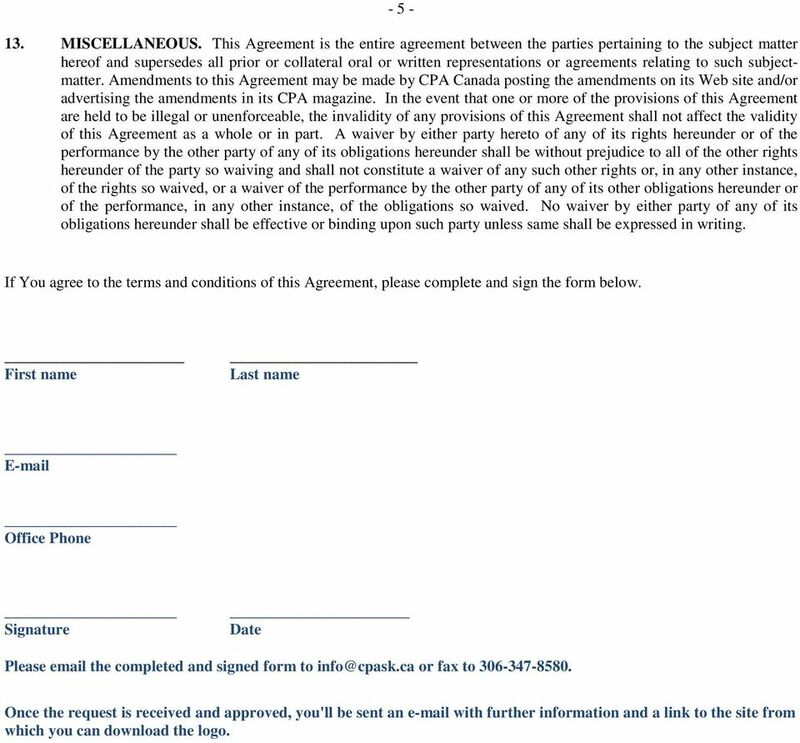 Nothing in this Agreement shall constitute a partnership or a joint venture between the parties. Neither party shall have the right to enter into agreements, pledge the credit of or incur expenses or liabilities on behalf of the other party. Without limiting the foregoing, You acknowledge and agree that any Provincial CPA Body may act as CPA Canada s agent for the purpose of implementing this Agreement. 10. THIRD PARTY BENEFICIARIES. 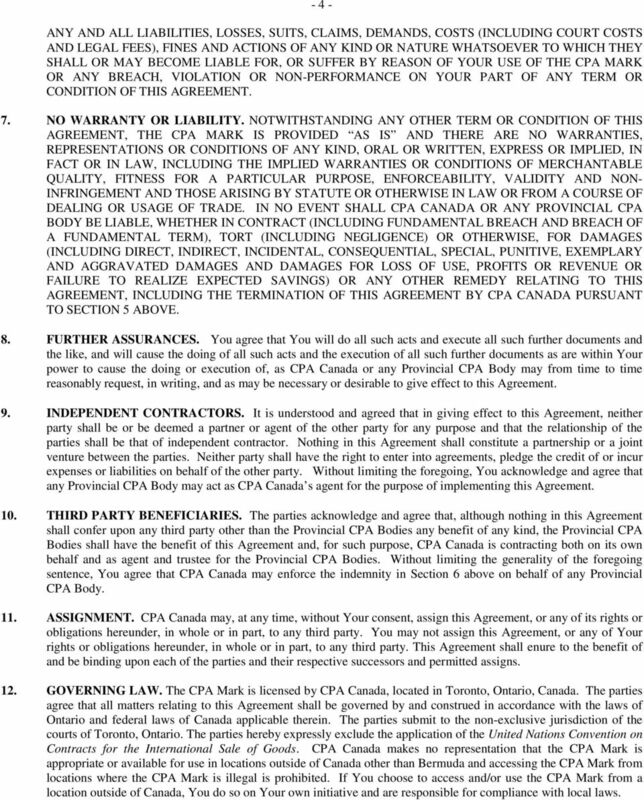 The parties acknowledge and agree that, although nothing in this Agreement shall confer upon any third party other than the Provincial CPA Bodies any benefit of any kind, the Provincial CPA Bodies shall have the benefit of this Agreement and, for such purpose, CPA Canada is contracting both on its own behalf and as agent and trustee for the Provincial CPA Bodies. Without limiting the generality of the foregoing sentence, You agree that CPA Canada may enforce the indemnity in Section 6 above on behalf of any Provincial CPA Body. 11. ASSIGNMENT. CPA Canada may, at any time, without Your consent, assign this Agreement, or any of its rights or obligations hereunder, in whole or in part, to any third party. You may not assign this Agreement, or any of Your rights or obligations hereunder, in whole or in part, to any third party. This Agreement shall enure to the benefit of and be binding upon each of the parties and their respective successors and permitted assigns. 12. GOVERNING LAW. The CPA Mark is licensed by CPA Canada, located in Toronto, Ontario, Canada. The parties agree that all matters relating to this Agreement shall be governed by and construed in accordance with the laws of Ontario and federal laws of Canada applicable therein. The parties submit to the non-exclusive jurisdiction of the courts of Toronto, Ontario. The parties hereby expressly exclude the application of the United Nations Convention on Contracts for the International Sale of Goods. 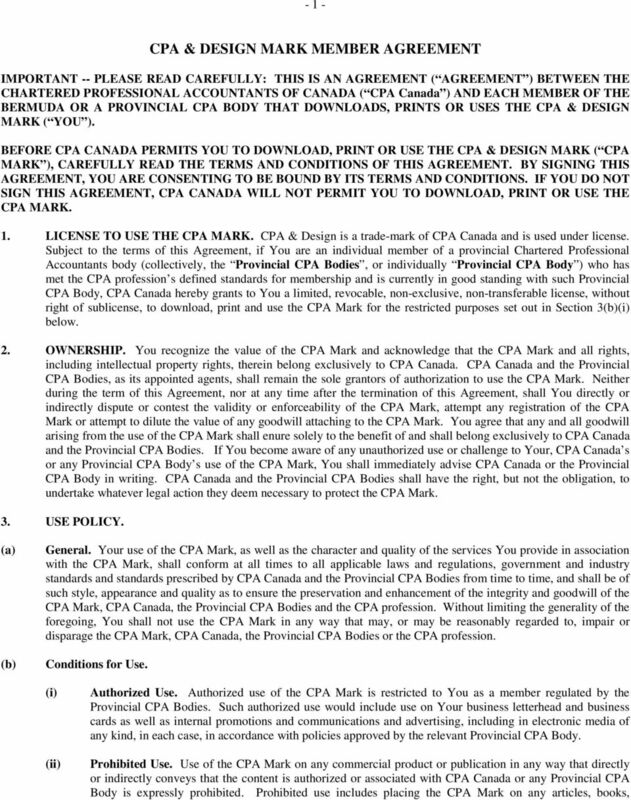 CPA Canada makes no representation that the CPA Mark is appropriate or available for use in locations outside of Canada other than Bermuda and accessing the CPA Mark from locations where the CPA Mark is illegal is prohibited. If You choose to access and/or use the CPA Mark from a location outside of Canada, You do so on Your own initiative and are responsible for compliance with local laws. 5 MISCELLANEOUS. This Agreement is the entire agreement between the parties pertaining to the subject matter hereof and supersedes all prior or collateral oral or written representations or agreements relating to such subjectmatter. Amendments to this Agreement may be made by CPA Canada posting the amendments on its Web site and/or advertising the amendments in its CPA magazine. In the event that one or more of the provisions of this Agreement are held to be illegal or unenforceable, the invalidity of any provisions of this Agreement shall not affect the validity of this Agreement as a whole or in part. A waiver by either party hereto of any of its rights hereunder or of the performance by the other party of any of its obligations hereunder shall be without prejudice to all of the other rights hereunder of the party so waiving and shall not constitute a waiver of any such other rights or, in any other instance, of the rights so waived, or a waiver of the performance by the other party of any of its other obligations hereunder or of the performance, in any other instance, of the obligations so waived. No waiver by either party of any of its obligations hereunder shall be effective or binding upon such party unless same shall be expressed in writing. If You agree to the terms and conditions of this Agreement, please complete and sign the form below. _ First name Last name Office Phone Signature _ Date Please the completed and signed form to or fax to Once the request is received and approved, you'll be sent an with further information and a link to the site from which you can download the logo.